What we have here is a New York band, whose music is built largely upon Balkan brass motifs, reimagining a 50-year-old work inspired, despite its title, by Duke Ellington’s tour of the Middle East, India and environs. On paper that might seem gimmicky, but it’s not. 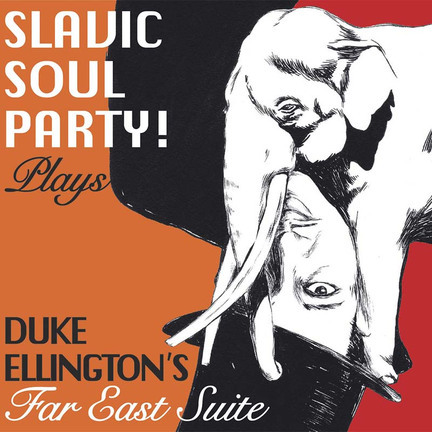 In a sense, Slavic Soul Party!-the nine-piece outfit behind this track-for-track interpretation of Ellington and Billy Strayhorn’s latter-day masterwork-brings the music closer to its source than Ellington did. Like Ellington’s orchestra, Slavic Soul Party! is populated largely by horns, including a pair each of trumpets and trombones, with another musician handling saxophone and clarinet. But where Ellington used a conventional jazz rhythm section to tie the East to jazz, SSP dispenses with those instruments, incorporating instead accordion, tuba, a single snare and other percussion, including hand drumming from bandleader Matt Moran. The result is engaging and invigorating. From the opening “Tourist Point of View,” SSP retains the key elements of Ellington and Strayhorn’s writing and the original arrangements, but disregards the urban refinement and Western rhythms that Ellington couldn’t help but bring to his own recording. Moran and band have been working the Balkan beat for more than a dozen years now-from world-music festivals to rock clubs-but more than anything theirs is a street music: The slow-paced “Isfahan,” in their hands, loses its elegant swank and becomes a dirge suitable for a New Orleans funeral, while “Blue Pepper,” about as close as Ellington ever got to rock and roll, simulates polyrhythmic Eastern wedding music in its reborn guise. Both Ellington and SSP close with the only track that actually does refer to the Far East, “Ad Lib on Nippon,” here a freewheeling, nearly 14-minute bacchanal of trombone, clarinet, trumpet and snare drum run amok. The joy is palpable. Judy Carmichael & Harry Allen: Can You Love Once More?